Summary: A wonderful first birthday cake to make for Noah, all 3 tiers are Vanilla Sponge with Raspberry Curd. Each tier was then covered in a brown fondant, with the house roof covered with red fondant. All animals have been handcrafted from sugar paste and all are completely edible. Overall a great cake to make and was extremely happy with the result. 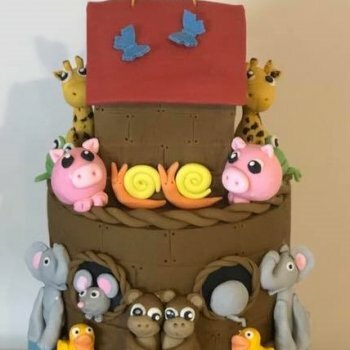 If you would like any further information about this cake or are planning your own function please feel free to visit our Wedding Cake Gallery or Other Cakes Gallery. We also offer all our wedding couples a free consultation and tasting, to find out more please click here. Please feel free to leave a comment below, we read each and everyone and reply to you all, it’s great to hear your thoughts and ideas. This entry was posted in Birthday Cakes. Bookmark the permalink.